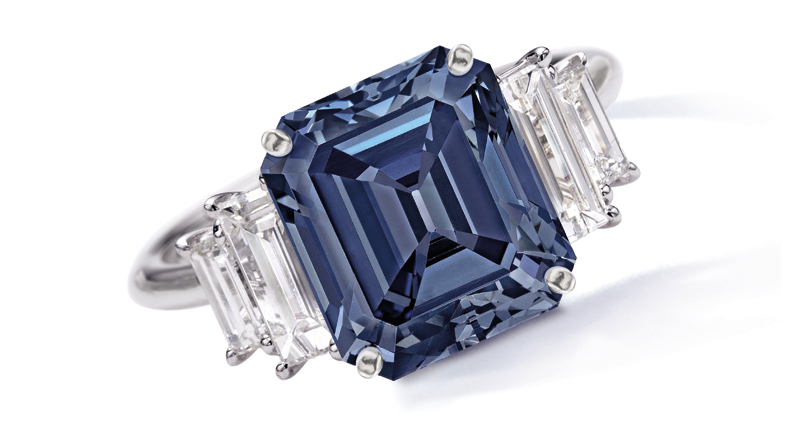 Natural blue diamonds are the rarest color of diamond found on the Earth. Classified as type IIb Diamonds, blue diamonds have boron within their crystal structure that allows them to emit a bluish hue. They are found super-deep in the Earth’s mantle and are extremely tough to find. The most famous blue diamond is the Hope Diamond, which can now be found in the Smithsonian Museum in Washington, D.C. Recently however, a 5 Carat diamond named “Ai,” the Chinese word for love, was auctioned at Sotheby’s Hong Kong Magnificent Jewels Auction for $13.8 million dollars! This incredible diamond is classified as Fancy Vivid Blue color and VS2 quality. It was mounted in an 18k White Gold ring, accented with four colorless baguette diamonds. A truly rare and exceptional ring for the ages! Learn more about the “Ai” Diamond here!